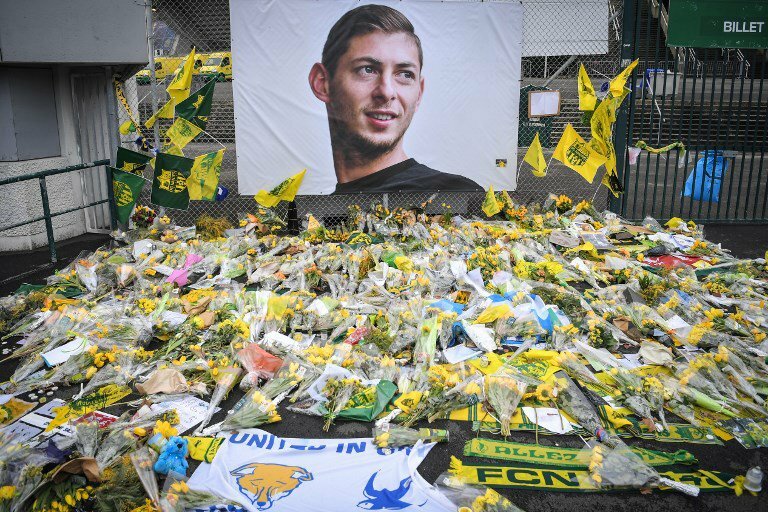 Argentine footballer Emiliano Sala's family grieved on Friday after British authorities formally identified his body as the one recovered from the wreckage of a plane that went down in the Channel more than two weeks ago. "We can now begin to mourn our son and our brother," the Cardiff City striker's family said in a statement. "We would like to thank you for all of your signs of affection and support in the most painful time of our life. "To see everyone doing everything possible to join us in the search has been a precious help to us." Argentine footballing idols Diego Maradona and Gabriel Batistuta also paid tribute to 28-year-old Sala. His French former club, Nantes, said it was retiring Sala's number nine jersey. All matches in France's top two divisions this weekend will be preceded by a minute of applause for him. The light aircraft carrying Sala from Nantes to his new club disappeared near the British island of Guernsey on January 21. The only other person on board was the aircraft's 59-year-old pilot David Ibbotson, who has not been found. Investigators recovered the body on Wednesday and transported it to the southern English coast. It was taken to Bournemouth where it was formally identified. Investigators said they were abandoning plans to lift the plane wreckage out of the water due to bad weather. "I am very sorry about this sad news. Many of us kept a glimmer of hope for you, Emiliano," football icon Maradona said on Instagram, following the identification of the body. "What sadness, this is the worst news. Rest in peace warrior," tweeted former Argentina striker Batistuta. "We are with you," he said. "When something like this happens it brings all the football family together," he said. "It's a loss to everyone in football." Initial search operations were suspended in the days after it went missing but a crowdfunding effort supported by thousands of donations, including from football stars such as Argentina superstar Lionel Messi, helped launch a private search. The plane wreckage was spotted by Mearns' ship. Britain's Air Accidents Investigation Branch then co-ordinated the recovery. Nantes coach Vahid Halilhodzic said Friday: "To talk about money in these moments is disgusting." He described the news that Sala's body had been formally identified as "awful" and "unfair". "We had always maintained hope but we knew in the end that it was slim, almost an illusion," said the 66-year-old, who wept as he spoke to reporters.